Crunchy, roasted chickpeas make for tasty, arguably healthy, and relatively quick bar bites. With cooler weather just around the corner, it’s time to crank up the oven. To heat up the palate, warm spices like cumin, black pepper, and cayenne give roasted chickpeas a punch of flavor and a heat that brings pink to our cheeks (the cocktails help, too). If you want something with a little more complexity, season the roasted beans with garam masala or a spicy curry powder blend. Whatever you do, make sure their completely dry and dark brown. They should shatter when you bite them. With nothing more than an inexpensive can of chickpeas (garbanzos), some olive oil and a little salt (all pantry staples), you can have this hearty snack prepped and toasting in 10 minutes. The oven does the rest of the work while you prep other dishes. Be sure to drain and pat the chickpeas dry between paper towels before tossing with oil and seasoning. The goal is to dehydrate them as much as possible as quickly as possible without burning them. Extra water slows that down. 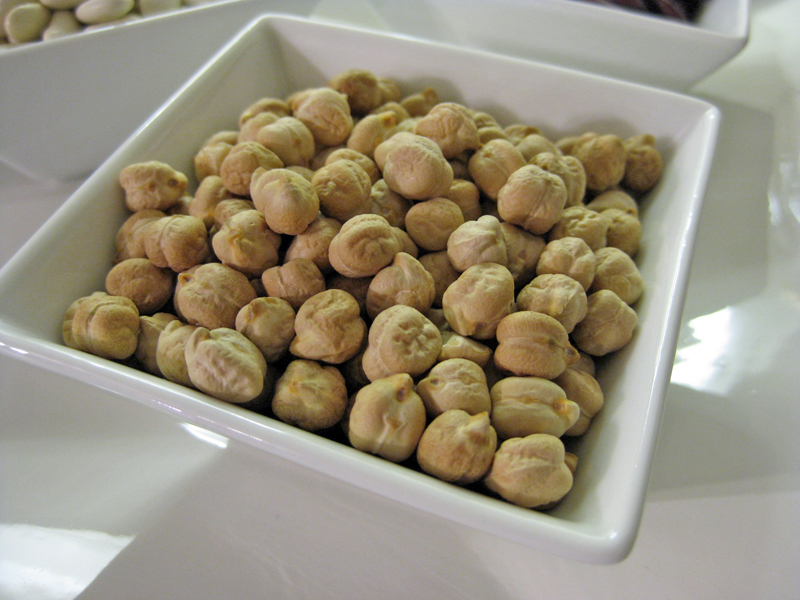 Roasted chickpeas are a perfect snack whatever the libation. They’re equally at home with a glass of bubbly and a pint of beer. Their spices get an amplification boost from stiffer drinks like our favorite gin martini or a great rye Manhattan. In the highly unlikely event you have leftovers, they make great croutons on salad. Whatever the occasion, roasted chickpeas are a guaranteed crowd pleaser! Drain the can of chickpeas (discarded or save water for another use)and pat down the peas with a kitchen towel or paper towels until the peas are as dry as possible. Place the peas on a sheet pan lined with parchment paper. Drizzle olive oil over them and toss until coated. Put the sheet pan in the oven. After 8 minutes remove the peas from the oven and place them into a medium sized bowl. Add the garam masala, kosher salt, and pepper, toss until coated. Put the peas back on the sheet pan and return to the oven for another 5-8 minutes or until dark and crispy. Let cool for about 10 minutes before eating. Top (L to R) Garbanzo beans with kalamata olives, roasted peppers, lemon & olive oil, accompanied with roasted goat cheese stuffed figs wrapped with prosciutto. With parsley, vinegar and olive oil. Bottom (L to R): With whole wheat pasta, saute of greens, shredded cheese, and prosciutto. With brown rice, peppers, pistachios, olive oil, and vinegar. I know I’ve been down this road with earlier posts. 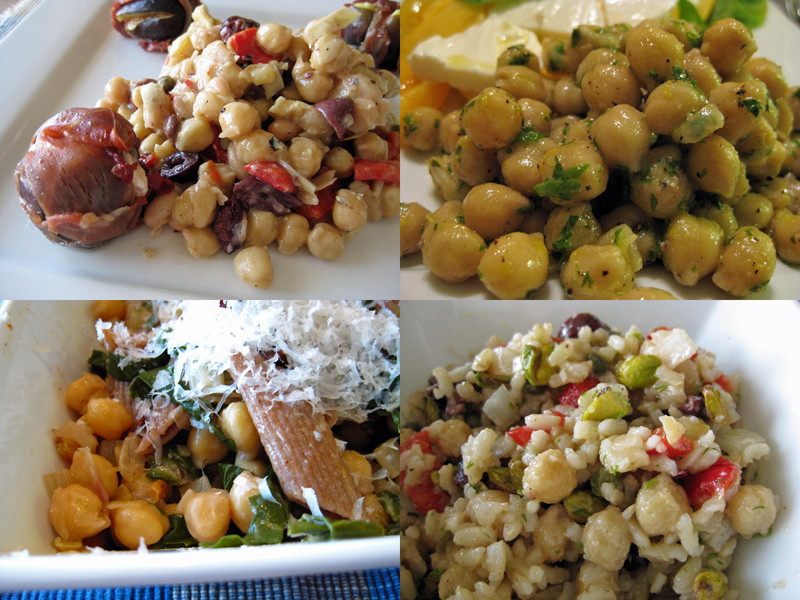 I’m a big fan of the legume and in our house, they’re almost always prepped and on hand for any number of uses. Our pressure cooker makes easy work of cooking dry beans. It takes a good 30 minutes to go from dry to tender. And because we don’t buy them in cans, we’re not only saving money, we’re reducing waste. The ceci bean (or garbanzo or chickpea or Egyptian pea) cooks just as quickly as any other hard, dry bean in spite of their rough and tough exterior. I love these beans for their firm texture and their warm, nutty flavor. Never mind that they’re packed with fiber and protein as well as a host of minerals including calcium and phosphorus. Most of us know them in pureed form as hummus, but we eat them in a variety of ways – whole in salads, as an addition to brothy soups, as a spread on bruschetta and as a companion to whole wheat pastas. After picking over the dry beans to remove dirt and rocks, give them a good rinse and then place them in a bowl and cover with plenty of water before soaking them overnight. After soaking, rinse the beans well and place them in a large stock pot, cover with fresh water and bring to a boil. Reduce heat and simmer beans for approximately one and a half hours or until just tender. They should be completely softened. This isn’t an instance where you want ‘al dente’ centers. You can skip the soaking step if you’re using a pressure cooker. Be sure to reduce the cooking time to approximately 25 minutes. You’ll want to release the pressure after 15 minutes to check them. Adjust the remaining cooking time accordingly. Cooked ceci beans are fine hot, but they’re even better at room temperature. Simply dressed with extra virgin olive oil, fresh chopped parsley, course sea salt and a dash of red wine vinegar, these beauties offer up a hearty, comforting bite.